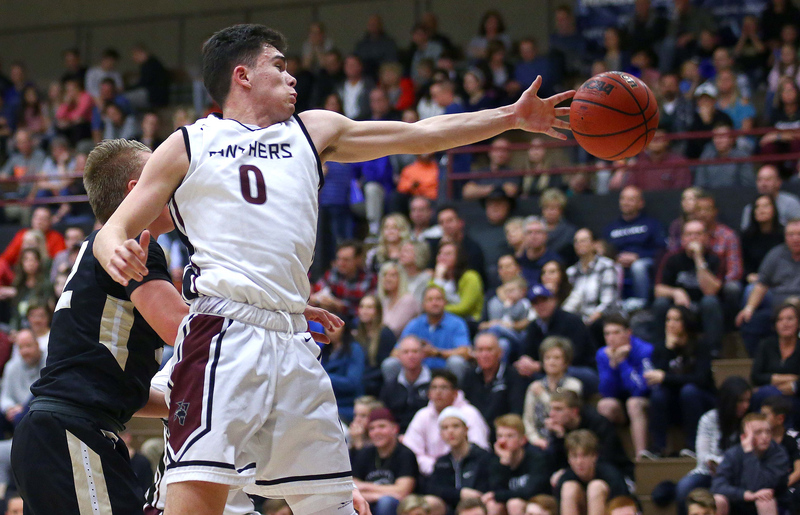 ST. GEORGE – There’s a lot of basketball left to be played (more than a month, in fact), but two early leaders have emerged in the Region 9 boys hoops race. And they happen to be teams that can win on the road. 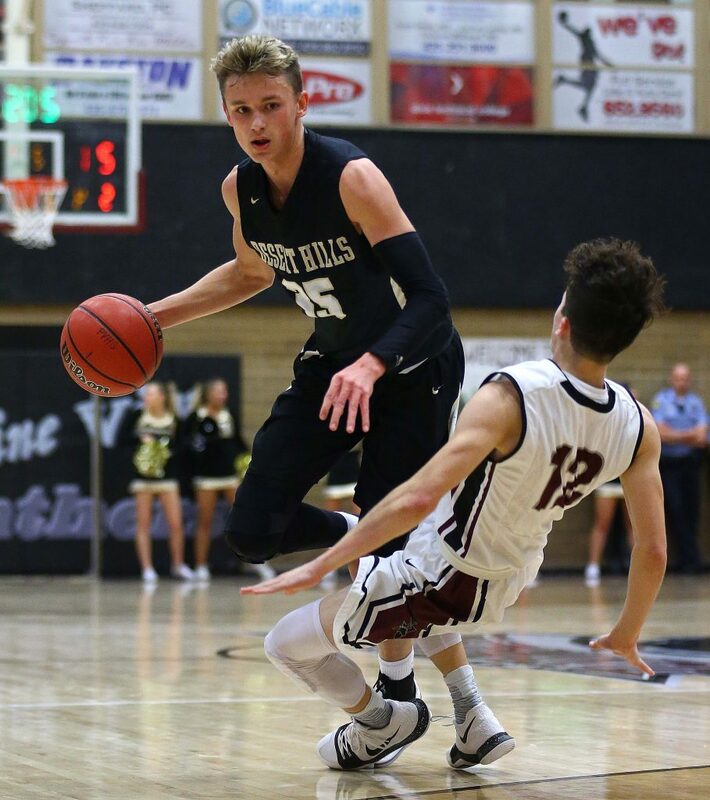 Desert Hills sprinted past Pine View on the Panthers home floor Friday night, and Dixie edged Hurricane in the Tiger’s Den, with the two wins placing the Thunder and Flyers tied atop Region 9 as mid-January hits. 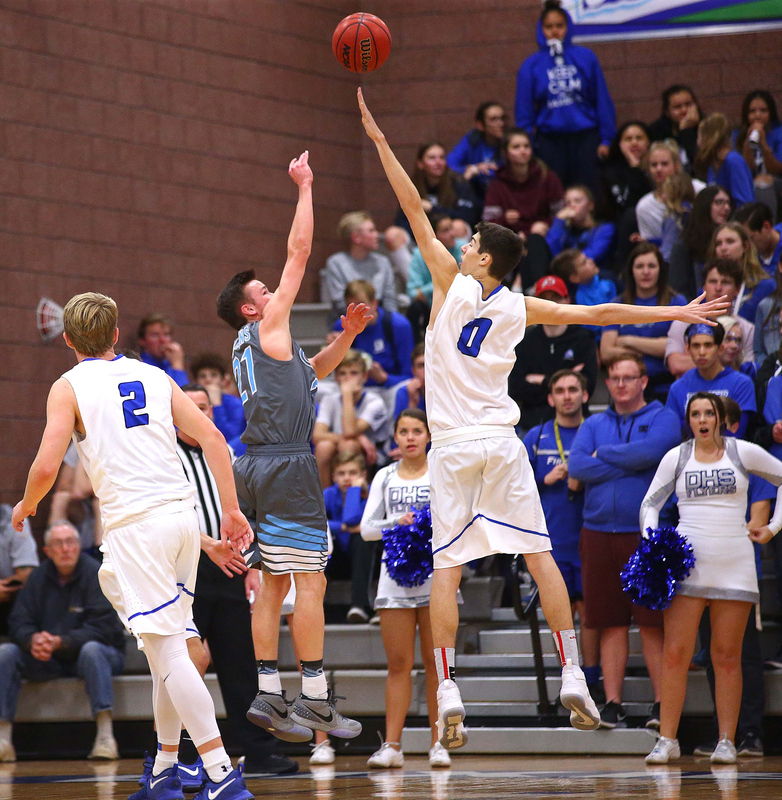 Hurricane sits alone in third place, one game back, and the rest of the teams in the region have gotten one win each, including Canyon View, which defeated Snow Canyon Friday. Four of the seven region teams have taken a bye, including the top three teams. The rest of the teams will bye over the next three region nights, starting with a bye from Canyon View next Wednesday. The Thunder went on a 10-0 run the final four minutes of the third quarter to seize control of the game and did not trail after that in capturing the road win. 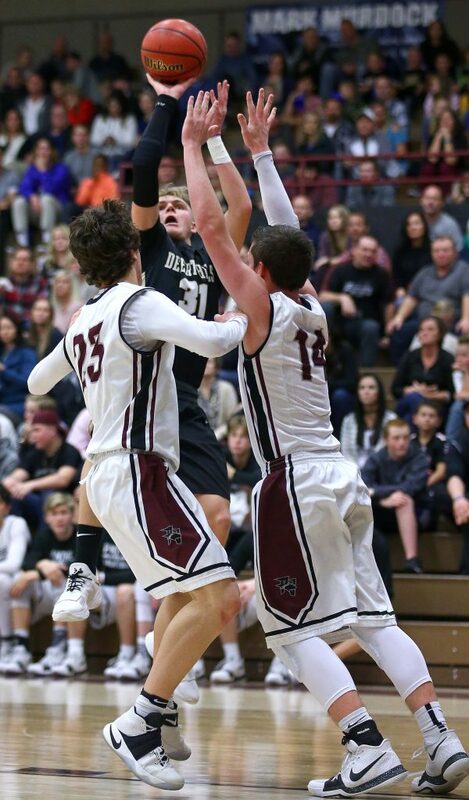 Pine View led 36-33 midway through the third after two treys by Jack O’Donnell and one by Tayler Tobler. It was still tight at 40-39 with just over four minutes left in the quarter when Ryan Marz completed a three-point play. That started that 10-0 run, which was capped by Webber’s 3 as the quarter ended, making it 50-39 heading into the fourth. 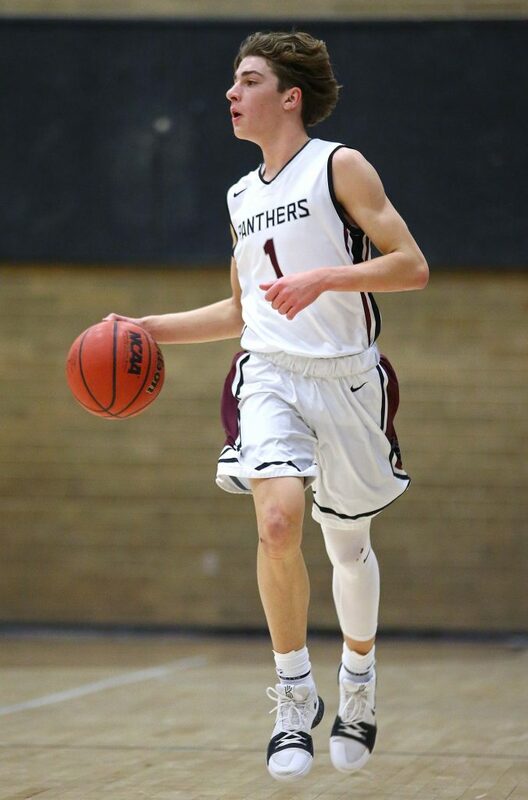 The Panthers actually closed within three at 58-55 with 4:13 left in the game after putting together an 11-2 run, but Desert Hills hit enough free throws to close out the win. Marz and Tucker Peterson each scored twice in the paint in the final moments to help DH secure the win. It was like a tortoise-and-hare contest. 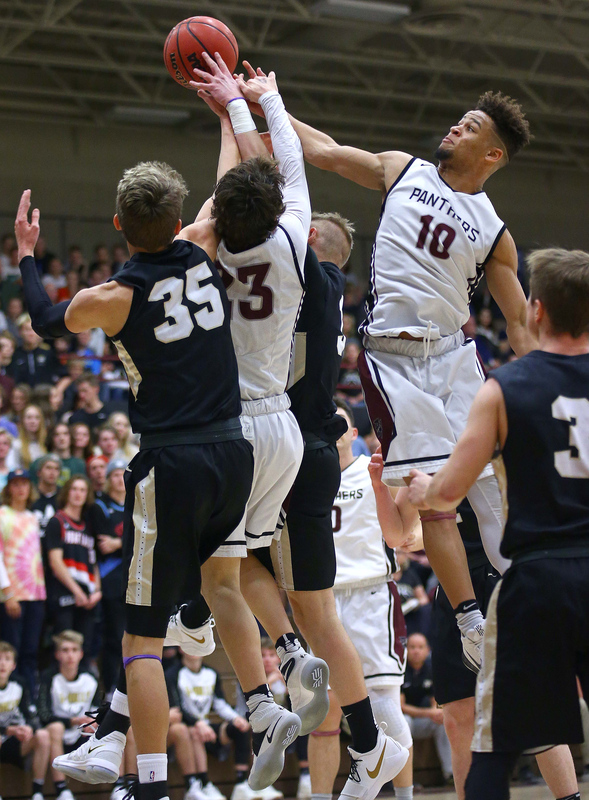 Pine View would go on a big run, keyed by 3-point shooting. But the Thunder used the slow and steady approach behind Marz to eventually pass the Panthers. Peterson was also huge, finishing with 14 points and a game-high nine rebounds. It was nip-and-tuck through the first half, with neither team leading by more than five points. 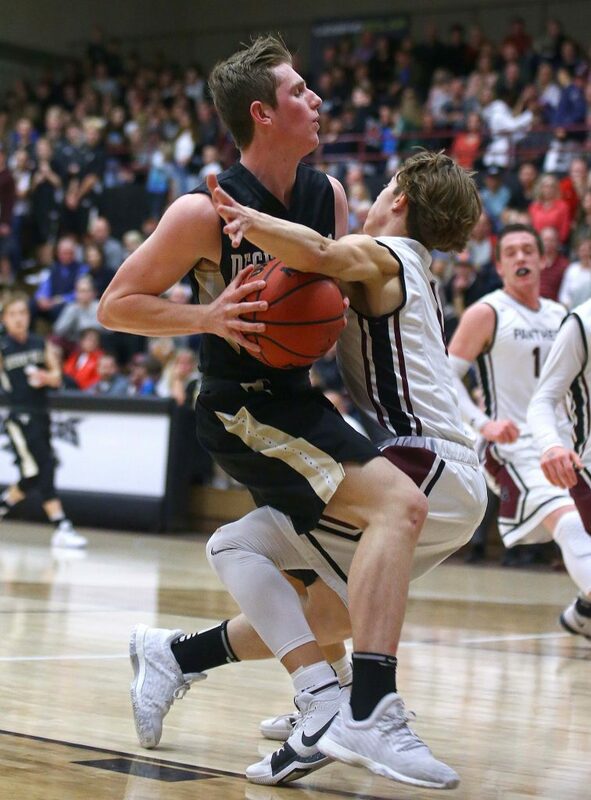 Desert Hills went into the locker room with a 27-26 lead and it stayed tight until the 10-0 D-Hills run. 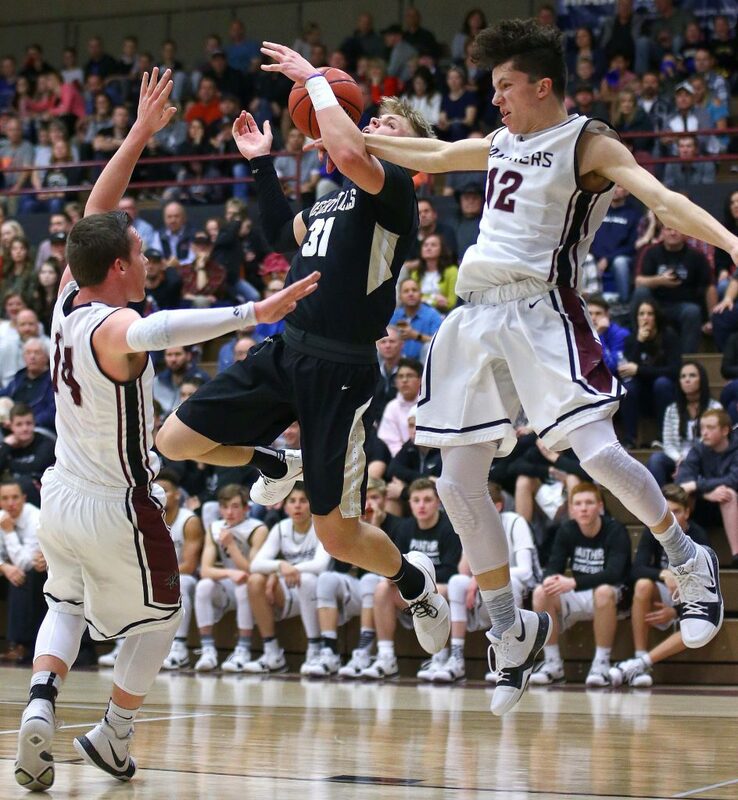 Pine View, playing without athletic Dallin Brown, fought back behind O’Donnell, Tobler and Michael Moten. Sophomore Ryan Hopper hit a 3-pointer with 4:13 left to make it a 58-55 game and give the home fans some hope. 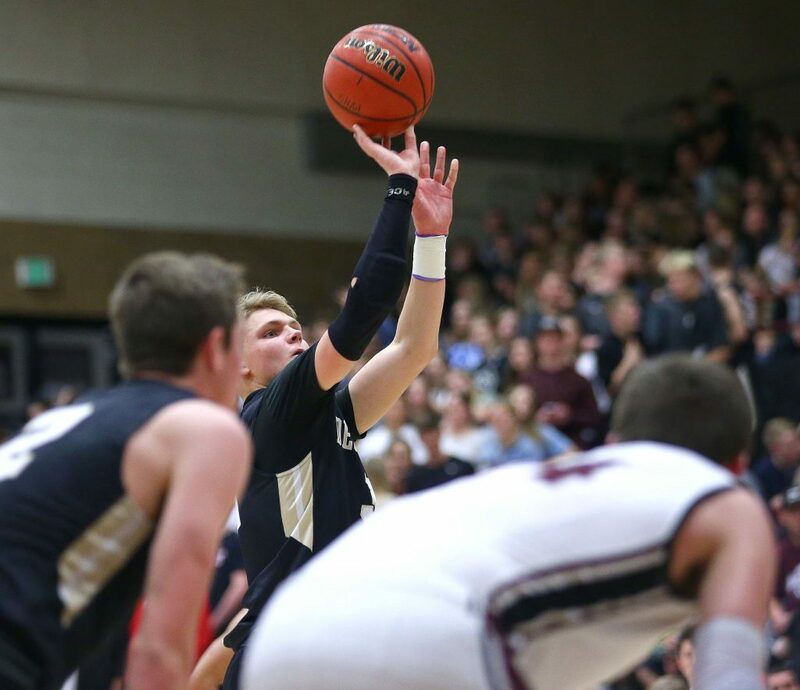 But Desert Hills answered by going to Marz and Peterson and by making four free throws in the final minute. The Panthers had one last shot at things with 30 seconds left. Tobler scored on a jumper to cut it to 66-63. 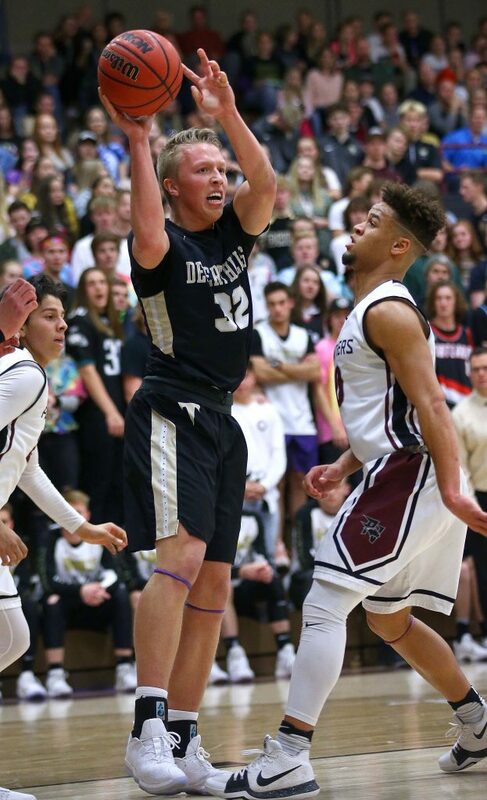 After two free throws by Desert Hills, O’Donnell had a good look at a 3-pointer with 16 seconds left, but the shot rimmed out and the Thunder iced the game from there. Marz finished with a team-high 17 points as well as seven rebounds. Webber scored 15, including three 3-pointers, and Peterson had 14 points and nine boards. 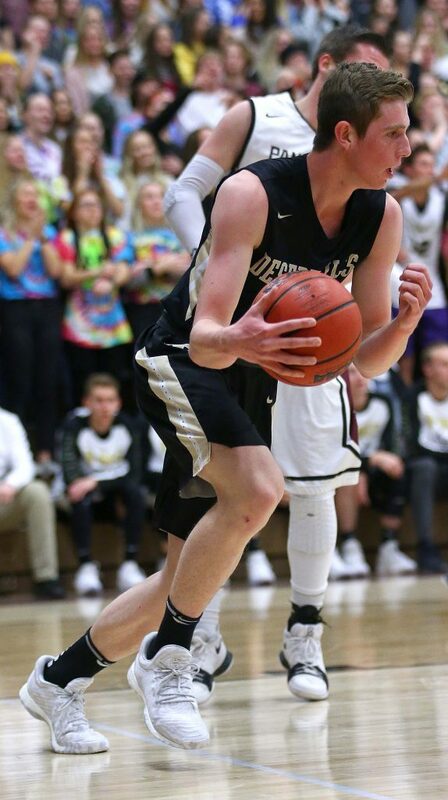 Desert Hills, 10-3 overall and 3-0 in region, made 24 of 50 shots (48 percent), and hit 16 for 25 from the line (64 percent). The Thunder outrebounded Pine View 34-24. O’Donnell led all scorers with 24 points (plus seven rebounds), while Tobler chipped in 16 points for Pine View (5-8, 1-3). The Panthers shot 27 3-pointers, making nine (33 percent) and were 10 of 18 from the line (56 percent). 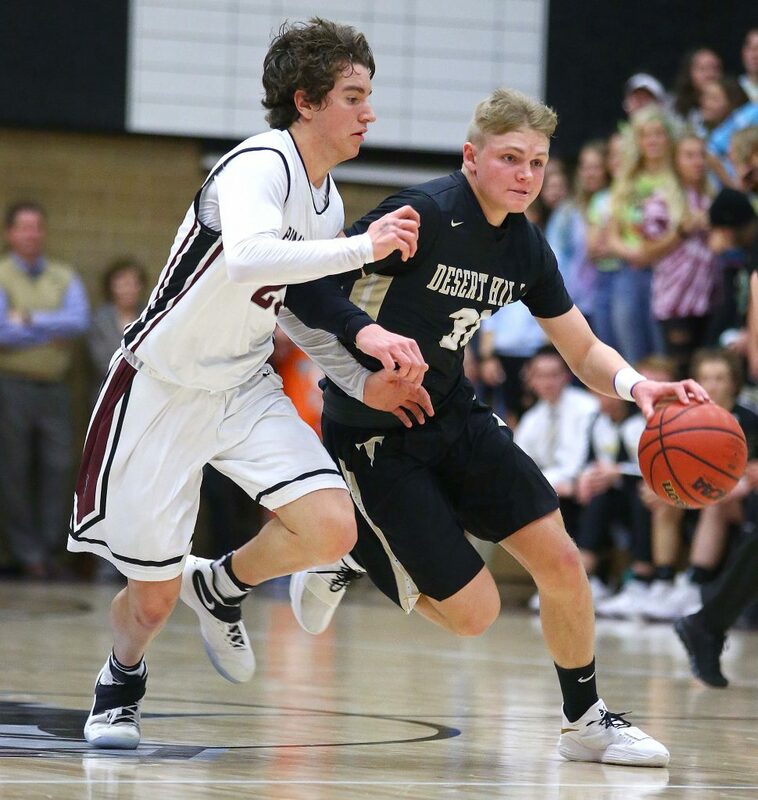 Desert Hills hosts third-place Hurricane Wednesday night, then goes to Dixie Friday night in what will be a critical week for the Thunder. 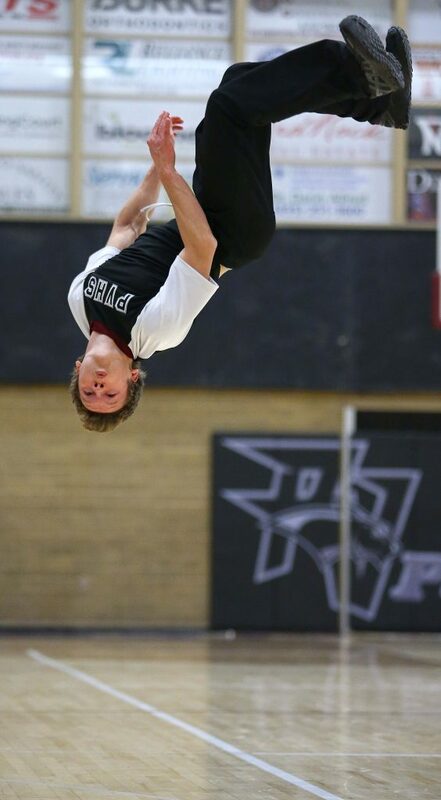 Pine View is at Cedar Wednesday and then visits Canyon View Friday night. Don’t think free throws are important? Consider this: Dixie won by two points after hitting 10 out of 14 free throws in the fourth quarter. Hurricane lost by two points as the Tigers hit just 6 of 12 from the line in the final period. When things were really tight, in the final 2 1/2 minutes, the Tigers made just 3 of 8 charity shots. It was a strange game as Hurricane dominated the first half and Dixie dominated the third quarter. But not surprisingly, as the final seconds dwindled away, it was a one-possession game. Hurricane set up for a final shot in the closing seconds, down by just two. But Dixie kept Tigers star Jackson Last from getting the ball and a desperation trey by Matthew Meyers was off the mark as the Flyers survived. Hurricane led by as many as 10 in the first half and when Adam Heyrend stroked a trey from the top of the key early in the third quarter, it was a 27-17 Tiger advantage. But the next 3 1/2 minutes would belong to the Dixie blue. Derek Cox and Tanner Cuff each scored in the paint to make it 27-21 and Brody Henderson converted a Hurricane turnover into a pretty 3-pointer to cut it to 27-24. Another Tiger turnover led to a driving layup by Cuff, then Henderson stroked another deep ball to put the Flyers ahead for the first time in the game at 29-27 with 3:15 left in the third quarter. Dixie pushed its advantage to 40-33 with 5:08 left in the game after a free throw by Henderson. Hurricane rallied behind Last, pulling to within 41-40 with 3:45 left after a 3-pointer by Meyers and a baseline jumper from Last. Akili Prince answered at the other end for Dixie to make it 43-40 with 3:27 to go. At that point, free throws became the story of the game. Hurricane went to the line for six straight free throws, with Heyrend, Meyers and Last combining to go just 2 for 6. That left Dixie still ahead at 43-42 with 1:40 to play. A tough layup in heavy traffic by Last gave the Tigers the lead back at 44-43 with 1:30 on the clock. 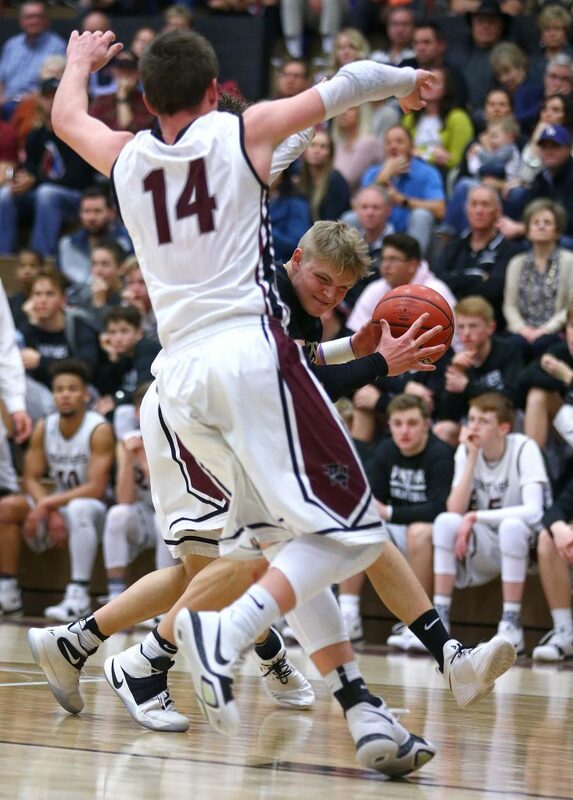 Tanner Cuff hit 1 of 2 freebies with 1:16 left to tie the game, but Cox rebounded the missed second free throw and was fouled. His ice-cold free throws put Dixie ahead 46-44. Heyrend was fouled with 56 seconds left, but made just 1 of 2, and Henderson matched that on the other end with 28.1 seconds to play. That set the Tigers up for one last shot. After a timeout, Dixie defended the play well and Meyers’ deep 3 was off the mark. 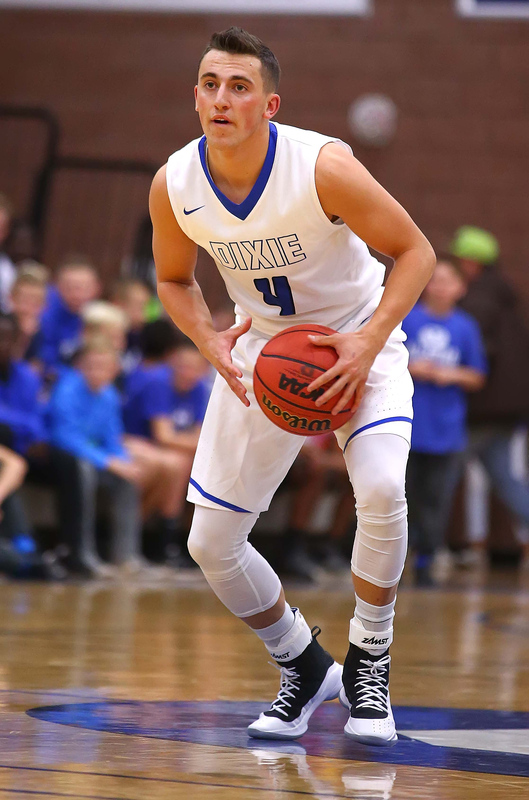 Dixie, 11-2 overall and 3-0 in region, had balanced scoring, with five players scoring at least five points each. Henderson led the way with 12 and Tanner Cuff had 10. Dixie made 5 of 12 3-pointers (42 percent) and hit 70 percent from the line (14 of 20). Hurricane, 8-4 and 2-1, was led by Last’s 24 points. He also had 11 rebounds and two steals, while Heyrend had 11 points and a couple of rebounds. The Tigers ended up 6 for 16 from deep (38 percent) and made just 13 of 22 free throws (59 percent). Dixie travels to Taylorsville Monday for a special Martin Luther King holiday exhibition. 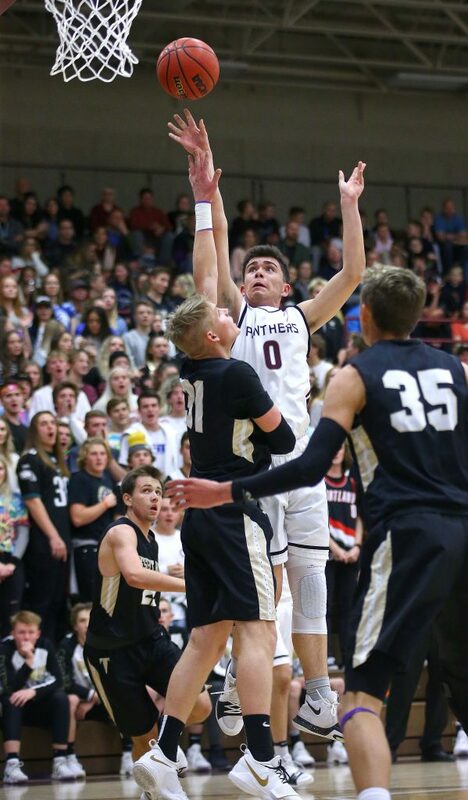 The Flyers will play Sky View, one of the top teams in 4A, at 1 p.m. at Salt Lake Community College. 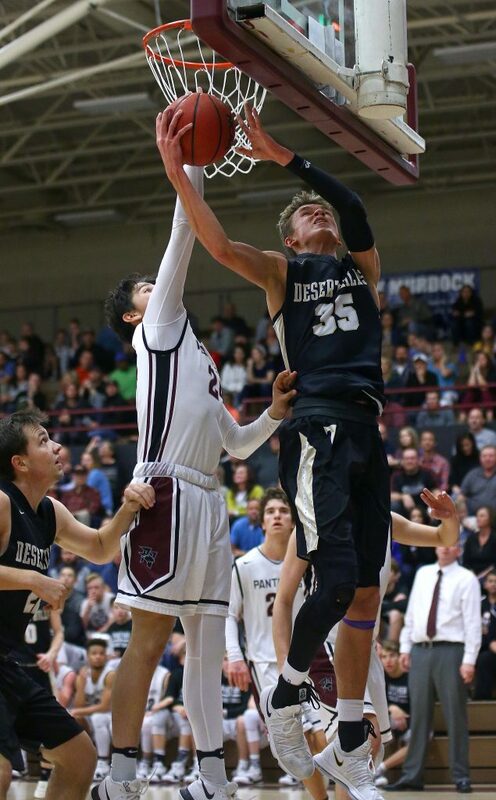 Dixie then returns to region play Wednesday with a home game vs. Snow Canyon. Hurricane has a tough roadie next week with a Wednesday visit to Desert Hills, followed by a Friday home game against Cedar. There was a bit of a feeling of desperation for the Falcons in this one. 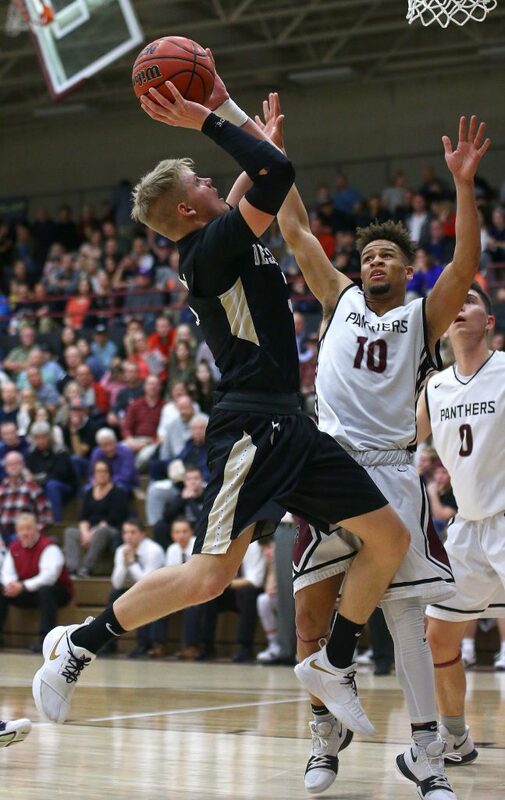 Thought of as one of the top teams in the region before the season began, and with one of the top players in Brantzen Blackner, Canyon View had limped out to an 0-3 start in league play. 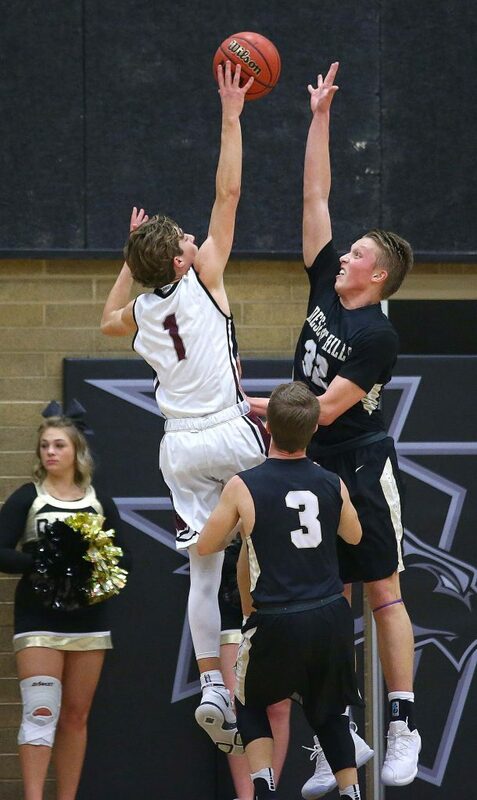 With their third home game in four outings, it was pretty much a must-win game for Canyon View and the Falcons came through behind seniors Blackner and Toby Potter. But it wasn’t easy. The plan worked as Canyon View was able to overcome the size disadvantage and a 31-30 halftime deficit to pull out the victory. Blackner, with 25 points and 10 rebounds, led the way. The senior guard, who was recently nominated to the McDonald’s All-America team, hit a pair of 3-pointers and helped slow down Robertson in the second half. 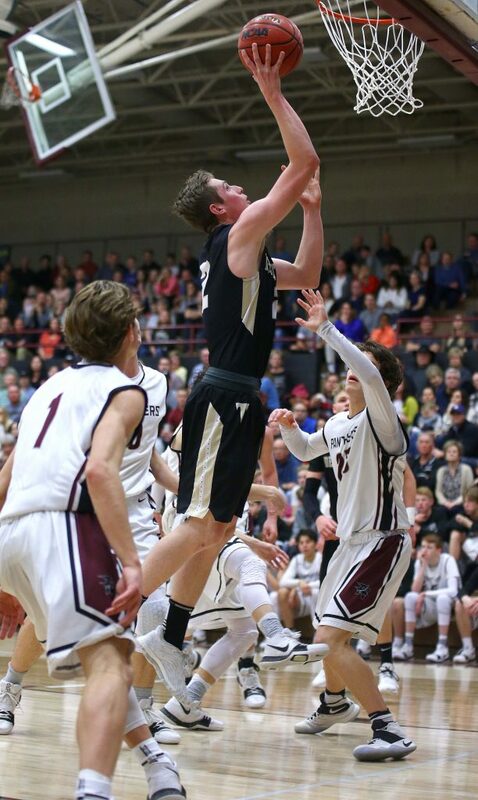 Toby Potter poured in 19 points as the Falcons outscored Snow Canyon 29-17 after halftime. 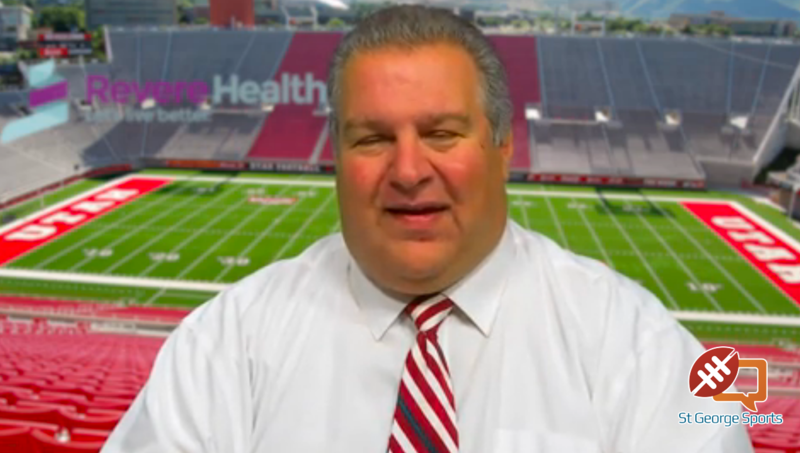 Coach Potter also credited the efforts of his son, Toby. Joey Lambeth hit a pair of 3-pointers in the second quarter that also aided the Falcons cause. Robertson led the Warriors with 21 points, plus he had eight rebounds, while Braden Baker added 13 points. Canyon View, 6-9 overall and 1-3 in region play, has a bye Wednesday, giving the Falcons a full week to prepare for a home game against Pine View next Friday. Snow Canyon, 5-9 and 1-3, is at Dixie Wednesday and then has a bye next Friday night.